WooCommerce Product Cost Price module allows you to save the cost you pay for the products you sell in your WooCommerce store, as well additional information (shipping, etc. ), for reporting purposes at a later date. 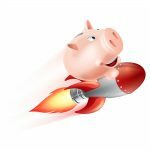 When you come to off-set the price you are paying versus the price you sell for, this tool will come in handy! Save WooCommerce product purchase costs data for admin reports! These are default product cost fields – choose which one (or none) do you need. 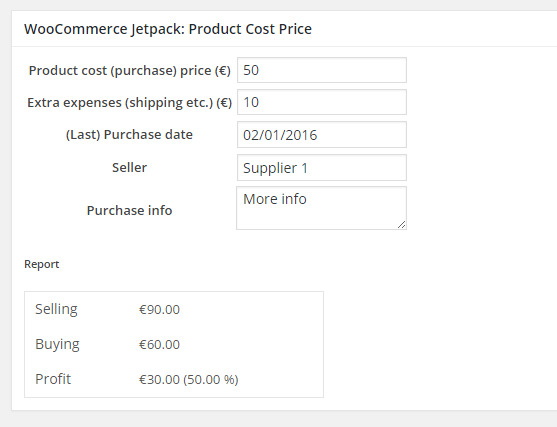 Add custom fields, which will be included in product cost calculation. You can choose field’s name, type (percent or fixed) and default value. Info fields are not used in product cost calculation, but you can save additional info (like purchase date) here. If you want to add Profit column to admin’s products list page, you can enable it in this section. After you set all options, visit selected product’s edit page. There you will find Booster: Product Cost Price metabox. After filling metabox fields, press Update, and Booster will automatically calculate products cost and potential profit for you. Hi. Is it possible to input different product cost for multiple variable products within a SKU? It seems like when I installed Booster, I can no longer view the variable products option. I have different “cost price” for each product variable. not possible for this moment. We added this feature to our to-do list. Let you know when it will be available. Same that Jesse, I have different cost in variable products. Please, let me know when you add this feature. How they look, the data generated in the Site Statistics of WooCommerce. Some new data is created? Graphics? I have activated the Product cost price option, it shows the profit “winst” of the product, only the profit is incl. taxt/VAT/BTW. Profit should be whitout TAX. Hi I have enabled this “WooCommerce Product Cost Price” feature. Your product description: “Save WooCommerce product purchase costs data for admin reports!” – I can’t see where in the admin reports I can see the profit figures? I can see on individual orders and on individual products but surely it would make sense to see this calculation on the “Admin Order reports” where you can see Sales figures? Have I miss understood this? This sounds amazing in theory. I had it setup and integrated on our website until a friendly customer sent me an email of his order email. His email receipt showed ALL of my costs for every product he ordered. Somehow it switched the store price with the product cost. It was terrifying. Unless someone can explain what happened and how to prevent it, I will never use a product cost plugin again. Really sorry to hear that, I can only image how unpleasant that could be. Product’s cost price is saved as standard “post meta”, so unless your email receipt was modified to show all product’s meta, I don’t see how this could happen. How this email receipt is formed? Is it standard WooCommerce email? Was it modified somehow? If you wish, you can create/share an admin account to your server (WP and FTP) so I could login and check what’s going on – I’m almost sure I could tell exactly why this happened. Hi. I only offer variable products on my eshop and all variations have the same price. This module is asking for a cost for each variation. Is it possible to only enter one price for all variations? Sorry for a slight delay. We’ve made some changes in plugin. Please download the development version here – http://booster.io/dev/. You will need to uninstall the old version first (don’t worry your saved settings won’t disappear). Now at the bottom of module’s settings (in “WooCommerce > Settings > Booster > Products > Product Cost Price”), you can find “Treat Variable Products as Simple Products” checkbox. Please let me know if it works as expected. And if you like Booster, please leave us a rating. Do I uninstall both the free version and the pro version before installing the development version you suggested? No, just free version. Plus version should remain as it is. Your product description: “Save WooCommerce product purchase costs data for admin reports!” – Is there a way to include Cost prices in the admin reports? I can see a profit line by line in the orderspanel, but I want a report which include retailprice AND cost price – it would be helpful when calculating the stores inventory value. is it possible to active ajax for realtime percent calculation? Can profit be shown in the Woocommerce reports revenue reports? The idea is good, only the profit calculation is not ok! It must be selling price – TAX – product cost price – extra expenses = profit. My questions relate to the managing of the Cost price field. As you call it the Cost of Goods, I would appreciate your feedback on this. Also sorely missing, import a CSV to bulk add the Cost to products, it is too slow and not practical to enter each one manually. We have 3500 products. Any chance of the above ? Totally agree that a deasent method for calculating Sell price from Cost price is very much aftersougth. I just can’t understand how òne can run a business without being able to calculate the earnings, and not to forget about budgets and forcasts. Ability to dissalow or notify when sales price goes below or reaches close to cost price. And ability to bulk edit product pricing so we can always be on top of pricing overall. Difficult with 1000+ Products to go to each one manually. We could probably add this, but could you please give more details – when do you want this notification to appear? I mean – are you changing prices manually, or have some plugin for automatic pricing enabled? As for bulk edit product pricing – not sure if this will be good enough, but there is “Bulk Price Converter” module in Booster (in “WooCommerce > Settings > Booster > Prices & Currencies > Bulk Price Converter”). Also there is more general “Product Bulk Meta Editor” module (in “WooCommerce > Settings > Booster > Products > Product Bulk Meta Editor”). Could you please take a look and let me know if you have any questions, or need something changed/added there. We use a plugin to import data to our store. What would the codes be for the fields so I can assign them to the CSV doc. Can the order profit be placed in some way in the new order email? Your product description: “Save WooCommerce product purchase costs data for admin reports!” – Is there a way to include Cost prices in the admin reports? I want a report which include retail price AND cost price. Not necessary at the same time but both available. 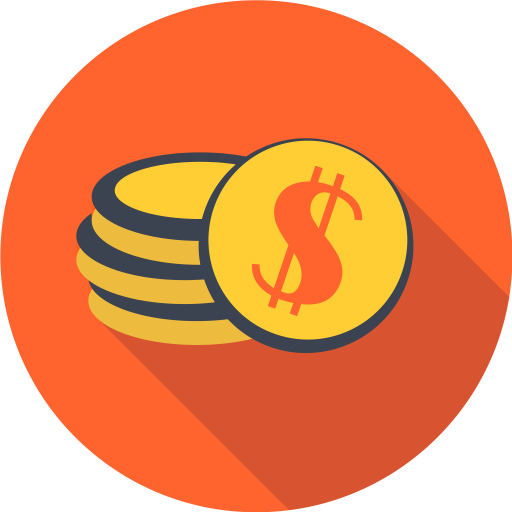 You can only include “Profits” in the admin reports at the moment and “Profit” with “Purchase cost” in Woocommerce Orders and Woocommerce Products screens. Bug found: Cost of goods module does not work as intended. When entering the cost of the goods and selecting update the field reverts back to (0) every time. Hi, When will the Tax problem be fixed?